SIP Trunks use Session Initiation Protocol (SIP) to deliver business grade telephone services over the internet. The technology, also known as Business VoIP, allows you to make and receive calls over a broadband internet connection. In common terms, SIP Trunks are essentially business VoIP phone lines that can have one or multiple channels. The channels determine the number of concurrent phone calls that can be made. Multiple indial numbers with specific area code prefixes can be allocated to a SIP Trunk. These are fully portable and not restricted to a particular phone exchange area. Existing PSTN and ISDN landline numbers can also be migrated to a Business VoIP service. BusinessCom SIP Trunks are provided by a Tier 1 Network Carrier, come with enterprise grade SLAs and are the perfect business VoIP solution. Our SIP PRO plan is only $50 per month and comes with 10 channels, which is equivalent to ISDN 10 capacity. NO flagfall. Timed calls are billed on a per second basis. Pricing excludes GST. Is Your Business VoIP Ready? Business VoIP and SIP Trunks are gradually replacing traditional telephone lines like PSTN and ISDN. With the rollout of the NBN and other broadband infrastructure, Australian businesses can now take advantage of this powerful and very flexible technology. SIP Trunks offer a much greater level of functionality and flexibility than traditional phone lines, and are ideal for businesses of all sizes. Businesses can reduce their fixed line telco costs by as much as 50% using SIP Trunks. SIP Trunks are a lot cheaper than traditional phone lines. Apart from cheap call rates, there is minimal line rental across a variety of flexible plans. Reduce your telco costs by up to 50% with business VoIP. Higher level of service provision than traditional phone lines including ISDN services that rely on the copper network. BusinessCo SIP Trunks are delivered using the state of the art BroadSoft BroadWorks platform and come with enterprise grade SLAs of 99.999% uptime. There are no physical telephone lines to connect or relocate. Additional call capacity can be activated almost instantly. Connect or disconnect call lines to suit your current business requirements. Supports your disaster recovery strategies, including alternative routing implemented in emergency situations. For example, in the event that calls are unable to reach your site, they can automatically be redirected to a nominated mobile service or alternative answering point. Delivering the ultimate in business flexibility, SIP trunks can be deployed in a variety of ways including PBX Systems, IP handsets, a mobile app or a softphone application. The replacement technology for traditional telephone lines. SIP Trunks are also the fundamental component of most Unified Communication and IP Telephony technologies. Business VoIP delivers significant benefits to any business operation and is superior in features and functionality when compared to traditional phone lines. SIP Trunks are perfectly suited to businesses looking to dramatically reduce their telco costs and gain access to a wide range of additional features and functions. SIP Trunks can be deployed in a number of ways including PBX, IP Handset, a Softphone Application or a Mobile App. This makes them exceptionally versatile and able to fit almost any business requirement. BusinessCo SIP Trunks can be used with all major PBXs. Connect them directly to the existing PBX and replace existing telephone lines to reduce line rental and take advantage of cheaper calls. SIP trunks can be programmed directly into an IP phone which then becomes a functioning telephone with its own call line and phone number. To make and receive calls, all you have to do is connect the IP phone to an existing broadband service. Turn your PC or laptop into a fully functional phone by programming a SIP trunk into one of the numerous computer software applications (softphones). Or use a mobile app to call from your mobile phone. This is especially useful when traveling overseas as calls back to Australia are charged at local call rates. Standard VoIP is a common technology that's only able to send voice messages and is usually deployed via an application. Business VoIP uses SIP (Session Initiation Protocol) which is a specific protocol designed to send voice, data and video messages. SIP is a powerful protocol that can be deployed in more ways than standard VoIP. It has much greater functionality including video conferencing, delivers higher quality calls and is ideal for UC (unified communication) solutions. SIP Trunks can be deployed in a number of ways. They can either be connected to an existing PBX system and act as a replacement for traditional telephone lines; or programmed into an IP Phone and used as a stand alone telephone line with its own telephone number. They can also be programmed into a Soft Phone on either a laptop or a PC, or into a mobile phone. This is especially useful when traveling overseas as the call being made back to Australia is charged at local Australian rates. Replace Your Existing PBX Phone Lines with SIP Trunks - majority of PBX phone systems installed in recent years are IP compatible and can be configured to use SIP trunks instead of traditional phone lines. IP-PBX Systems - require SIP trunks to connect with the Public Switched Telephone Network (PSTN). 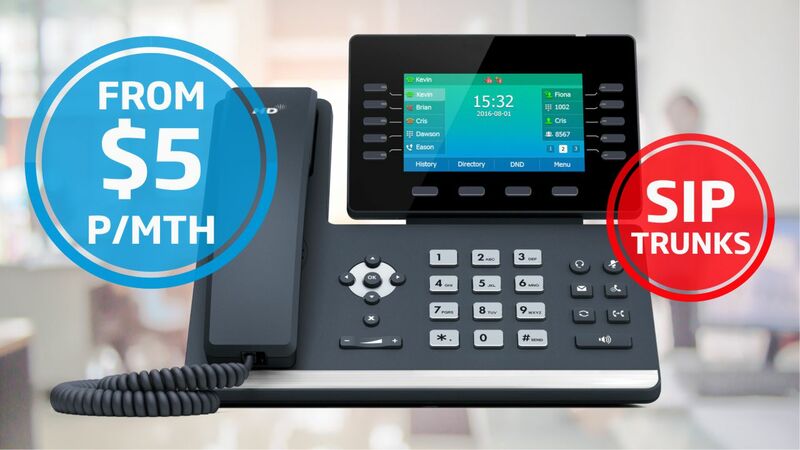 IP Phones - a perfect solution as a replacement for stand alone telephone. Use with an IP video phone for conferencing. PC or Laptop Softphone - use a headset to eliminate the need for a desk phone. Also suitable for UC applications including video conferencing. Program Into a Mobile Phone App - use an app such as Bria to turn your mobile into a SIP phone. Ideal for international travelers who want to use their mobile to call Australia. Calls are charged at local call rates. Business VoIP will eventually replace all PSTN and ISDN services. If your business has the required broadband infrastructure, you can start taking advantage of this powerful technology now. How Reliable Is Business VoIP? SIP Trunks deliver a service provision level of 99.999%, which is higher than any other phone line technology, including ISDN. BusinessCom utilises an Australian Tier 1 Network provider that specilises in enterprise grade IP telephony. Our SIP trunks come with business grade SLA's and are delivered directly from the carrier. How Much Data Does a VoIP Call Use? VoIP call data usage depends on the codec and may vary between 0.5MB and 1.2MB per minute. A VoIP call uses a relatively small about of data. With an average call being 3 minutes and using 2 MB of data, 1GB will cover approximately 500 calls. What is the Minimum Bandwidth Required? Yes. BusinessCom has Local Number Portability (LNP) agreements with all the major carriers. The process of migrating phone numbers is called porting. Existing numbers allocated to PSTN and ISDN services can be ported to a business VoIP service. Once ported, they will no longer be attached to a specific telephone exchange. This is of great benefit to businesses that may want to change premises and keep the same number. If your existing PBX system is IP enabled, changing over the phone lines to business VoIP is easy. A SIP trunk with the required number of channels is issued with allocated DIDs (direct in-dial numbers / landline numbers). This is usually done within 24 hours of receiving the service application. PBX technician programs the SIP credentials into the PBX. Temporary diversions are set with the existing carrier. Calls to existing business numbers are routed to SIP numbers. Porting process of existing business numbers is commenced. Numbers will be migrated and allocated to the SIP trunk. Once the porting process is completed, old telephone lines are disconnected. Can I Use a SIP Trunk as a Fax Line? SIP Trunks are not recommended for use as fax lines. We recommend a Virtual Fax Service as a replacement. One of the most popular ways is to transfer your fax number to a Virtual Fax Service. That way you'll be able to eliminate the need to maintain a dedicated fax line and a fax machine.